Today’s internet world, website HTML source codes can be viewed by the people at any time on internet browser without restriction to the users. By pressing few commands on your system, instantly you can view the source code of website on your respective browser. All the front-end design of your website can be viewed easily on the browser with clean source codes, the search engine read the source code to be indexed based on robots meta tag. As a typical internet user, you visit a website, explore its all features enjoy the content like videos or read something for gaining knowledge. Everything seems so perfect in the front end that is also called the user interface. However, only a few people know that there is a complex structure of coding lies in the back which is difficult to understand. This language is known as source code where the entire structure of a website is defined. It involves every small and big thing of a website such as images video links, written text, and call to action buttons. It is the source code that decided how to represent each element of a website in an organized manner. Along with programmers, there is a huge influence of source code over SEO practices of a website. That is why you need a source code viewer tool. Generally, people use some shortcut keys to obtain the source code of a web page that vary on the basis of operating systems and browsers. In the Windows operating system, Ctrl+U is the shortcut key to obtain the source code from a website. On the other hand, Chrome & Safari of Macbook requires Option+Command+U button to execute the command of source code. When you press these keys altogether, the source code of a website will appear in the next tab of your browser. Now the question is, if one can use simple shortcut keys for obtaining the source code of a webpage, then what is the need for a source code viewer tool. The answer is hidden in the below article. Read carefully to gain your knowledge. To Generate meta tags use our free tool meta tag generator, similarly to create robots.txt file use robots txt generator tool. The site structure completely depends on HTML and CSS code, with this 2 standard web programming languages any website can be developed with beautiful design. Along with design, other elements like images, text, a headline will also play important in design aspects. While considering all these, the website will be fascinating and catchy to the visitors. What is Source Code Viewer? A source code viewer is an online tool accessible through various websites It is meant for obtaining the source code of a domain link it is also called HTML viewer because the entire source code is written in hypertext markup language. All websites provide this tool for free of cost with many other bundled tools essential from the perspective of programming and digital marketing. It is a one-stop platform to view the source codes of all websites. When you use the shortcut keys to execute the command of showing source code, a new tab appears. In this way, a couple of tabs will open that creates confusion and slow down the browser. It is necessary to have a platform where you can check the source code of every link one by one without slowing down the browser. While checking the elements of source code from the perspective of SEO such as title, meta description, and headings, you need to explore multiple pages. A single website may contain numerous pages with crucial information. It is important to analyze each of them thoroughly. For this purpose, a source code checker is a great tool. A list of some popular source code viewers is mentioned below. All of these tools are meant for serving the same purpose. The only difference that you will find is its user interface. It may vary but very convenient to operate. The process of utilizing these feature will be mentioned in the below article. However, first, you need to know why do we need a source code viewer tool. Why do we need the Source Code Viewer tool? It is one of the biggest advantages of an online business that you can know many strategies of competitors who is more successful than you. For instance, the hosting service they are using, source code structure, global ranking & regional ranking, etc. All you need is the knowledge of implementing the right tool in the right place. Open the website of your competitor, get the source codes of all pages with the help of this tool and save them in a file. Now compare their titles, headings & descriptions, etc. with yours to conclude where are you lagging. As a programmer, you can even identify their weaknesses and improvise them in your source code. The search engines like Google & Bing read machine language of source code for indexing purpose. The crawlers classify a website on the basis of information mentioned in the source code. If SEO elements like meta tag, title, headings and descriptions are not as per the parameters of search engine algorithm, the page will face difficulty in ranking. For instance, if the length of meta title is less than 60 characters, the browser will show the problem in a loading page error. Even if you did the perfect SEO work for ranking, the page will be totally worthless to the end user without the required information. If any error is occurring from front end users, it will badly affect your online business. Whenever someone reports difficulty in using a certain piece of information or buttons available on the website, the programmer checks these errors with the help of source code. The source code viewer makes it easy to identify the errors and rectify from the back end. While visiting a website, whatever we experience such as beautiful animations, fonts, images, etc. are arranged with the help of complex source code. This source code is built with HTML that remains invisible behind. It is a complex structure that requires precision in building otherwise the website will not get recognition on the search engine. The source code viewer is a very useful tool to check where the actual problem is occurring with the user interface. If the search engine is not indexing your page at the expected category of search results there must be some error in the source code. You can view it with the help of this tool to fix. If there is an issue in identifying the error, it is advisable to compare it with your competitor’s website for better understanding. After building a fully responsive website with all essential pages, it's ranking at the topmost place on the search engine is the main objective. SEO is the primary and most effective strategy for this purpose. The entire content of a web page must be fully optimized according to the algorithm of a search engine. While searching something on Google, the user enters a keyword and get results. These results come with a small title representing the website and tow lines of text explaining the content in more detail. These are called title tags and meta descriptions. If these small pieces of information are formatted in a wrong way or wrong text, the crawler will not be able to index you in the right search criteria. Also, internet users will most probably skip your website because of the lack of information. If the bounce rate is still high after implementing all marketing strategies, there must be something wrong with the source code. You can easily check it with source code viewer too. There is no need to open multiple tabs for every single page. Just one tool is enough to obtain the source code of all pages one by one. How does the Source Code Viewer tool work? The tool provides only front-end source code, but not the back end server side codes like (PHP, .Net, Perl and many other server-side scripts). Because it executes a server-side application and displays only web page front end results. In order to know how to use, just enter website URL in the respective text box and click submit button. Within few seconds you can view the source code of any website URL. The purpose of this tool is to check seo meta tags, HTML codes, call to action form and other tags for developing website design, marketing techniques. The source code viewer is a very convenient tool which is accessible for free of cost. Read the following steps to know the process of using them. Copy any of the above-mentioned URL of source code viewers and paste it in a new tab. When the page will open, space will be provided where you need to enter the address of the web of a page that requires source code analysis. Paste the URL of that particular website and click on the “view source code” button. It will instantly generate the source code that will be mentioned in the below space of that page. For checking the errors, press Ctrl+F to find title tag, meta description or any area where the problem is occurring. The browser will highlight that particular word so that you can easily identify the error and fix it. With the help of the tool, you can identify all the seo factors used on the competitor's website and also you can identify alternate text used on the images. Some of the websites restrict to view the code or protect the content on the site.This tool will scan the site and retrieve the web page source to the user. This is just for understanding how the site has protected the content. It helps in identifying the reason for slow loading. Excessive coding reduces the speed of a website which is responsible for a high bounce rate. If the meta contents are not in proper format, length and not containing the relevant information, the search engine will not index it in the right category. The source code viewer tool can help in identifying and solving the issue. If your website has hidden or manipulated content affecting the ranking, source code viewer is the easiest way to detect it. Maybe it is not visible because of the transparent text but cannot hide from the source code file. 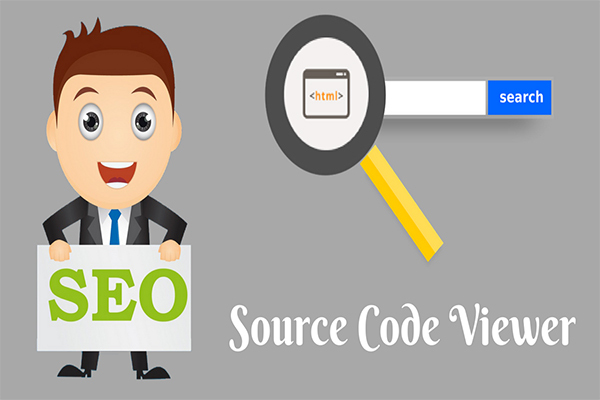 This information is enough to educate you with the crucial need for source code viewer tool. Both programmers and SEO executives need it for their different purposes.